Hello Friends! I'm playing catch-up! I had a very full weekend and although I was able to color each day, I just didn't have time to post my color shares. So, today you get a two-fer! LoL! Okay onto what I've been up to. Honestly, not too much...just some coloring fun with Lawn Fawn. It occurred to me that I have quite a few LF sets and I haven't shown them any love. Since I knew ahead of time I would be on the move this weekend, I stamped out several images onto smooth white card stock, using My Favorite Things Black Licorice Hybrid Ink. I colored all of the images with Copic markers. Then I die cut them. 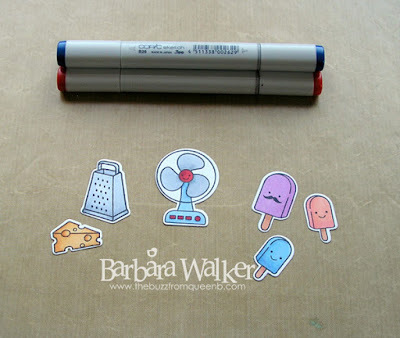 I love these images from Lawn Fawn's Best Pun Ever stamp set. The little cheese and the grater are adorable. And that face with the mustache cracks me up! The puns that can be used with these images are perfect: cheese/grater=you're the gratest. fan=you're fantastic. ice creams=you're the coolest. Which can also be used with the fan. Just a super fun set and I have an idea rolling around in my head for them, I just need to find some time! I pulled out another fun Lawn Fawn set, Critters in the Forest. 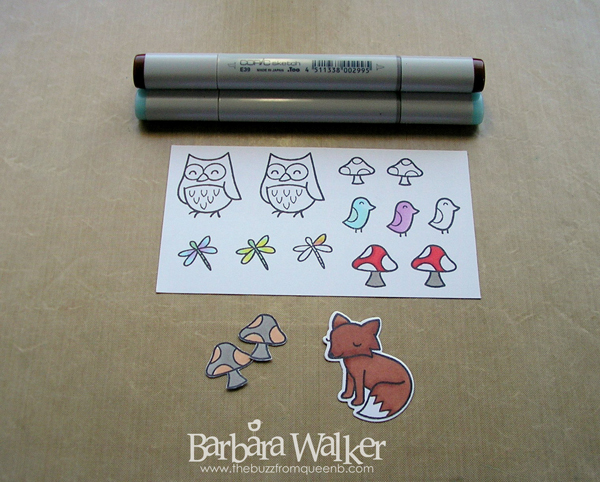 I have a lot of favorites in this set; the fox, the mushrooms, the dragonflies, all so cute! I try to always purchase the coordinating dies, too. Lawn Fawn dies are some of the best I've used. They are easy to use, they line up perfectly and they cut like a dream.